Published: January 30, 2019 10:01 Mythily Ramachandran, Special to tabloid! Is music the privilege of a select few? Rajiv Menon’s musical drama ‘Sarvam Thaala Mayam’ while raising this valid question takes viewers through the life of Peter Johnson — son of a Dalit mridangam (percussion instrument) maker — who aspires to learn music from none other that the renowned percussionist Palakkad Vembu Iyer. Inspired by the life of Carnatic mridangam vidwan Umayalpuram K Sivaraman, ‘Sarvam Thaala Mayam’ is beautifully narrated and complemented by spectacular performances. Malayalam veteran Nedumudi Venu and music director/actor GV Prakash are a delight to watch. Peter (Prakash) is a crazy fan of Tamil actor Vijay. 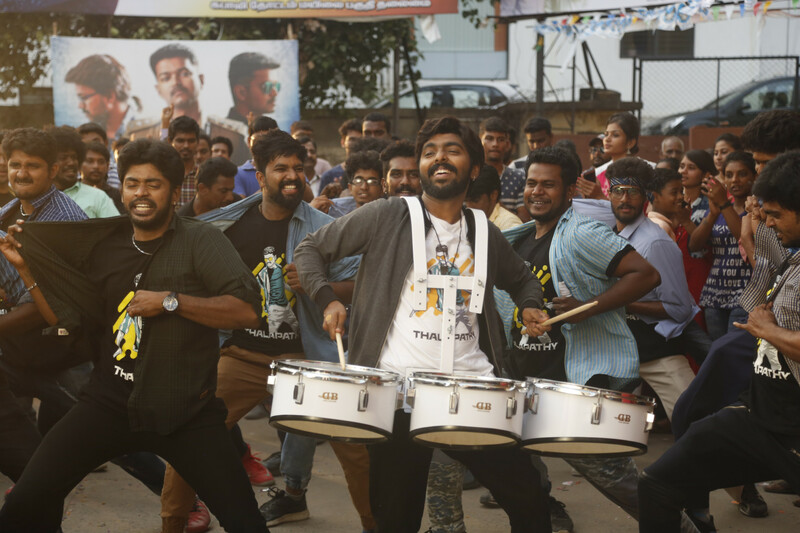 This easy going young man prefers skipping his examination so that he can play the drums during the release of a new Vijay film. His father Johnson (Kumaravel) makes mridangam, probably the last in the family to continue with the trade. Peter is not particularly keen on taking up his father’s livelihood. What fascinates him though is the mridangam’s beats after he happens to watch from close quarters a live performance of noted mridangam artist, Vembu Iyer. From then on, his heart beats for the mridangam, changing his course of life altogether. He is adamant about learning mridangam under Iyer. Will he accept a Dalit as his student? Menon found the spark for this story while making ‘Overtone’ — a documentary on the life of mridangam artist UK Sivaraman. For the role, Prakash trained under Sivaraman for a year before shooting commenced. The results are there to see. Prakash just lets himself go on-screen bringing out Peter’s passion for percussion and his perseverance in learning the instrument. After ‘Naachiyar’, Prakash proves his versatility again. The two-time Indian National Award-winner Venu depicts Iyer with the expertise only he can boast of. Shanta Dhananjayan as Iyer’s wife appears in few scenes, yet in those few moments she has left a mark. The scene where she quickly changes the channel to watch a cartoon seeing her husband enter the room is hilarious. Kumaravel is one actor who never disappoints. He plays Peter’s father and their bond is beautiful. Malayalam actor Vineeth surprises in the role of Mani, Iyer’s assistant who is overcome by ego and jealousy. A romantic angle is woven into the tale with Malayalam actress Aparna Balamurali as Sarah, a Malayali nurse who attends to Peter’s injury following a scuffle. I couldn’t help wishing that Menon had given more space to their love. Menon’s earlier two films, ‘Minsara Kanavu’ and ‘Kandukondein Kandukondein’, both romantic dramas, are fondly remembered. ‘Sarva Thaala Mayam’ is a feel good entertainer and without beating up a loud noise conveys that music exists for all and not bound by sect, religion, culture or language. It releases in the UAE on February 1.